Urban teens today are under incredible pressure from peers and mass media to conform to the ways of the world. Inteen® provides wisdom and guidance from the Bible to help 15- to 17-year-olds make independent and intelligent life choices. Bible stories are complemented by contemporary stories, helping teens incorporate biblical principles into their everyday lives. Curriculum, including Scripture discussion and memorization, encourages young people to social and political action as well as personal growth on their walk with Jesus Christ. 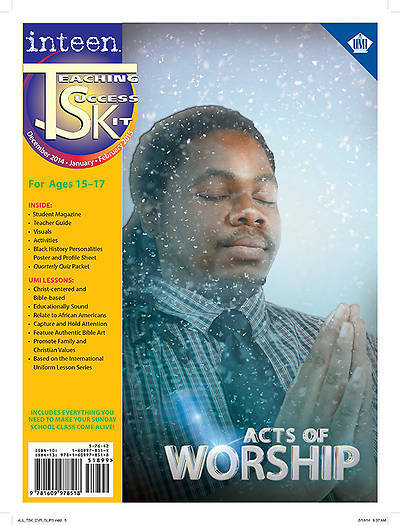 The Teaching Success Kit includes Student Magazine, Teacher Guide, Visuals, Activities, Black History Personalities Poster and Profile Sheet and Quarterly Quiz Packet. Like all our curriculum, Inteen is based on the International Uniform Lesson Series.